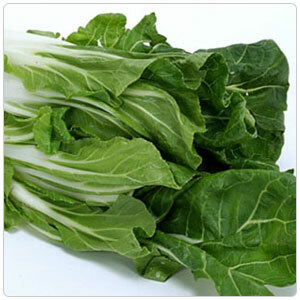 A hearty green and relative of beets, most varieties have wavy, ruffled, dark green leaves growing from a pale white rib. Other varieties, like Rainbow Chard, have red, yellow, and orange ribs extending up through the leaves. Both the leaves and the ribs can be eaten. It is best to cook the leaves separate from the ribs as the thicker ribs will take longer to cook. Chard can be blanched, braised, sautéed or steamed for use as a side dish or vegetable component, and in soups. The bitterness fades as it is cooked with an end result that is more refined and less bitter than that of cooked spinach. Swiss chard is not only one of the most popular vegetables along the Mediterranean but it is one of the most nutritious vegetables around and ranks second only to spinach as being one of the worlds most healthiest vegetables.